Home/Austria at 9% organic, is that a perspective for Germany? 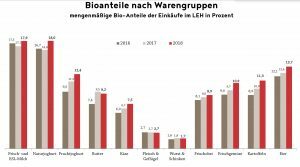 The current organic results for 2018 in Austria can be more than impressive: The bioconcentration in our neighboring country is well above the German level with still only 5.3% – If you look at the figures for the freshness of sales in detail, it is found that the structure of the strong product groups and articles is quite similar to the German organic consumption profile. Eggs, milk and dairy products are far ahead. 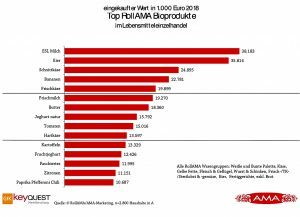 What makes organic consumption in Austria so strong? Only a few things can be deduced from statistical values. For example, that food retail and discount in our neighboring country very actively and sustainably contributes to this offer. Only if the really strong distribution channels are so behind, such values ​​are possible. But there are other moments: The conviction on the topic of bio has tradition and thus a stable ground for acceptance. Perhaps also important: On the basis of one’s own geography, it was learned early on that landscape conservation and bio form a meaningful and important synergy. This can also be seen from the fact that the producer share of organic farms in the dairy industry is so high. And yes, we also have to address one last point: the awareness of quality in food is perhaps even more pronounced. A clear indication of this can also be found by comparing the appearances of major retail chains operating in Germany and Austria – especially with Aldi and Rewe. And yet – there are also many details that point to a common ground. Despite the good purchasing conditions in Austria, the consumption of organic quality meat and sausage is also below average in Austria. The tendency to – at least partial – vegan diet has also changed Austria. This is a food chain that spans several continents and is expected to develop in the future. And in this respect too, organic farming in Austria is very well positioned.